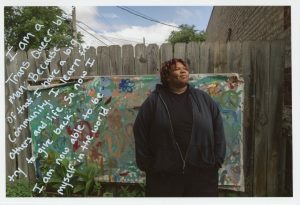 Wing Young Huie’s project “Shifting Identities” will involve Wing photographing five people in the four neighborhoods connected by 38th & Chicago, each in two ways that show their shifting identities (diptychs) for a total of 10 photos. Wing will interview each person and collaboratively write a back-story that will complicate and challenge the perceptions of their photos. The photos will be printed in a 10-page zine with the 2 photos of each person on opposite pages. The back-stories will be inserted separately in the zine so viewers can react to the photos first before reading the back-stories. The zines will be distributed in the Little Free Libraries in the four neighborhoods.